For years the traditional bitumen road has been the go-to choice in many countries, but there is the potential that this could change in the future. While still in its infancy, an ambitious project by a husband-and-wife team of engineers, Scott and Julie Brusaw, has led to the creation of initial versions of what could become solar-powered roads. With support by the US government, their solution comes in the form hexagonal panels that interlock and are powered by the sun. There are several benefits to their design that go beyond just environmental. In fact, if their vision sees more widespread support and implementation, these solar-powered road panels could benefit all aspects of road transport. Let’s face it, as soon as you move away from cities and major suburban/rural areas in Australia, road visibility at night drops significantly. Beyond reflectors either on the road or to the side of the road, driving down a desert or country road usually requires the use of high beams. Poor visibility isn’t just restricted to night time drives in the country. When it rains in Australia, the white road markings that cover most of our roads become almost indistinguishable, making it incredibly difficult to see if we’re potentially veering onto the wrong side or into another lane. The solar panel roads currently in development come with LEDs installed in them. These LEDs can change colour and take on an almost endless series of patterns and shapes. These LEDs would replace traditional painted road markings. Because these markings would be an actual light source, that means they would be clearly visible at night. If a particular stretch of road was notably dark, then additional LEDs could light up to give a soft glow for the entire stretch. And if heavy rains were to strike, stronger and more vibrant road marking colours could be employed to combat the washed out visibility. This is a big plus for road safety. When a car crash or other road hazard occurs on our roads, there’s always a delay between such an event occurring and drivers being made aware of it. In fact, often there will be no warning at all. 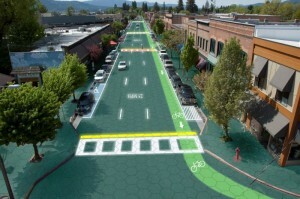 With solar panel roads, however, they’re designed to note when potential hazards have occurred. Say, for example, a tree has fallen across a road – the solar panel roads have sensors in them that can identify something has fallen. By extension, a dynamic warning can be displayed ahead of the hazard (e.g. LEDs lighting up to write ‘Hazard ahead’) for all drivers. This ability to more immediately and effectively warn drivers of upcoming dangers is something that could ultimately save lives. While not much of Australia experiences snow during the winter, there still are areas that do or, at the very least, will experience some iced roads. The proposed solar-powered roads are actually capable of generating heat during the winter months. What this means is that any snow (or ice) that falls on these roads can be melted away, reducing associated the risks to drivers. Naturally, solar-powered roads will also be an environmental and energy revolution. In the US alone, these solar-powered panels would absorb around three times the amount of energy Americans use every single year. So, in other words, the energy captured by these panels could then be directed into homes and businesses and basically replace traditional, more harmful coal-powered energy – and their would be no shortage of energy to boot. This would also lead to a substantial drop in carbon emissions and greenhouse gases. Essentially, our carbon footprint would be reduced by 75% in the short term, and even more in the long term. For a country like Australia where we have a substantial amount of strong sun throughout the year, we’d also reap similar benefits of a surplus of solar power energy and reduced emissions. Last but not least, as the roads are constructed out of hexagonal panels, they are easily replaceable and require far less complicated upkeep than current roads. And as these panels utilise a large percentage of recyclable materials, they can be reused and repurposed, instead of simply adding to our landfill. Across the board, solar panel roads have the potential to change road transport for the better. Not only in increasing safety and making it far easier on drivers to navigate any road throughout the country, but also in terms of easier upkeep and environmental sustainability. All that’s really needed is for countries throughout the world to be open to adopting such technology. To find out more, you can check out their website here.